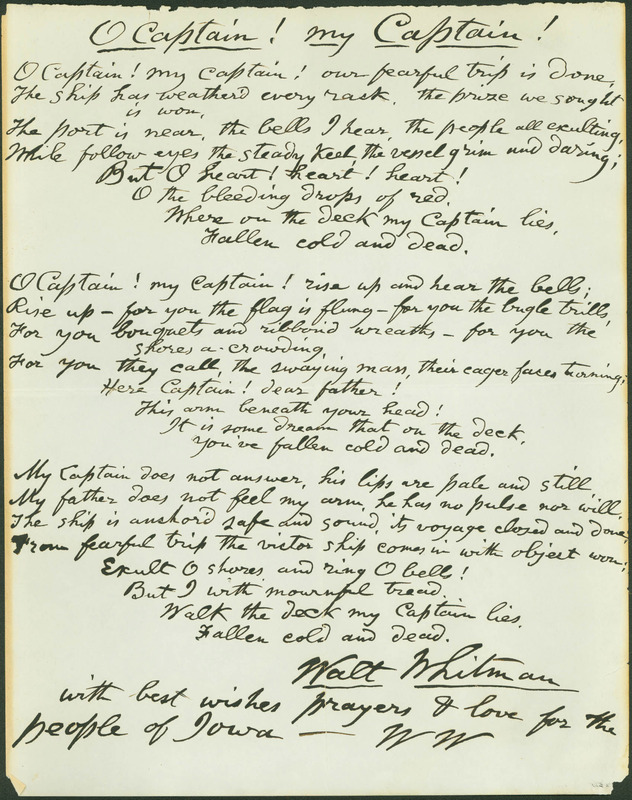 Autograph document signed by Walt Whitman, containing stanzas from “O Captain! My Captain!”, Whitman’s elegy to Lincoln. The poet submitted this document to Charles Aldrich for his collection of autographs, which he donated to the State of Iowa in 1884. Aldrich was the first curator of the State Historical Department of Iowa, now the State Historical Society of Iowa. Although Whitman composed the poem in 1865, the date of this autograph is unknown. Megan O., Laney R., Kiersten T., Alexis W.
Use of this item for research, teaching and private study is permitted with proper citation, and attribution. Reproduction of this item for publication, broadcast or commercial use requires written permission. for permission, please contact State Historical Society of Iowa.